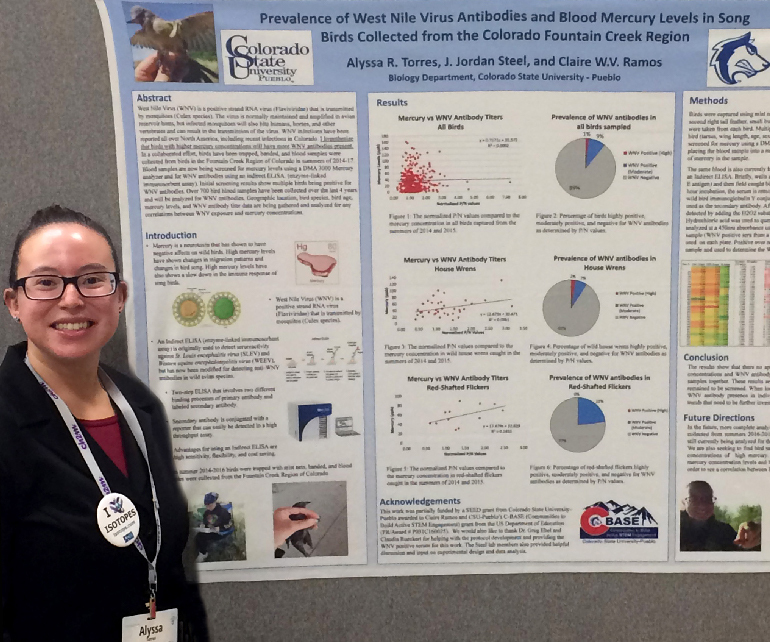 PUEBLO – A senior biology major at Colorado State University-Pueblo recently placed third in a national student poster competition for her research presentation on the prevalence of West Nile Virus (WNV) antibodies and blood mercury levels in song birds from the Colorado Fountain Creek Region. Pueblo native Alyssa Torres, placed third in the Best Undergraduate Student Poster competition at the Society of Environmental Toxicology and Chemistry (SETAC) North America 38th Annual Meeting last month in Minneapolis, Minnesota. She received a certificate and cash award for her efforts. The SETAC conference brought together scientists, risk assessors, regulators and environmental managers from academia, business and government from around the world for five days of cutting-edge scientific presentations, learning and networking opportunities. The theme, “Toward a Superior Future: Advancing Science for a Sustainable Environment,” was reflected in the 2,000 presentations and 180 poster and platform course offerings, sessions, and setting. Torres was able to attend this and other conferences through her involvement with the Communities to Build Active STEM Engagement (CBASE) grant as an undergraduate student research fellow and has high hopes of publishing her research before she graduates. She said the topic came about as a way to combine two research projects she was engaged in with two professors. Her research with Biology Professor Claire Ramos focused on the correlation between blood, breast feather, and tail feather mercury in song birds. But she admits to having a secret obsession with viruses and so approached CSU-Pueblo virologist Jordan Steel, who accepted her with open arms. Both Ramos and Steel are faculty mentors for CBASE, providing mentorship to research fellows such as Alyssa and research interns. Torres has trapped and banded wild song birds and collected blood samples from birds in the Fountain Creek Region which were screened for mercury levels using a DMA 3000 Mercury analyzer and for WNV antibodies using an indirect ELISA (enzyme-linked immunosorbent assay). The research showed higher levels of mercury may correlate with WNV infection. Initial screening results showed multiple birds being positive for WNV antibodies. Those same bird species have also shown higher levels of mercury than the other species. More than 800 bird blood samples were collected over the last four years and were analyzed for WNV antibodies and mercury. News of her award was met with disbelief.